If you’re living in most of the greater 48 states, you’ve probably noticed the temperature dropping significantly. Many of you may even be dealing with snow flurries way before you should this season. I feel your pain. I happen to be down in Atlanta, GA, but the temperature’s no better here either. Freezing, freeze warnings, mass panic about Snowmaggedon 2.0, we’re suffering too. Due to these ungodly cold temperatures, the slow cooker has become one of my greatest allies in the battle against winter. Beyond the stews and the chilis and the regular crock pot fare, I’ve started to get creative with what I can throw in there and get out a finished meal. My latest creation: the honey mustard pork loin roast. It’s flavorful from the Dijon mustard and honey, it’s so moist from the chicken broth and onions it bakes in and it’s beyond tender from baking for 10 hours. Plus, your house will smell amazing when you come home. And like I said, what do you need more than an easy recipe to feed a lot of people with little effort on your part around the holidays? Not a lot. Happy early Thanksgiving my friends! Stir together mustard, honey, balsamic vinegar, garlic, salt and pepper in a small bowl. Slice slits into the pork roasts, place in a 6 – 8 quart slow cooker or crock pot and then rub all over with mustard mixture. Add the onions on top of the pork and pour in the chicken broth. When pork is done, remove from crock pot, shred with two forks (it should be super tender by now) and replace in the crock pot broth. Divide pork up evenly and serve over rice, noodles or some other pasta-type side that will absorb the liquid and flavor of the broth. 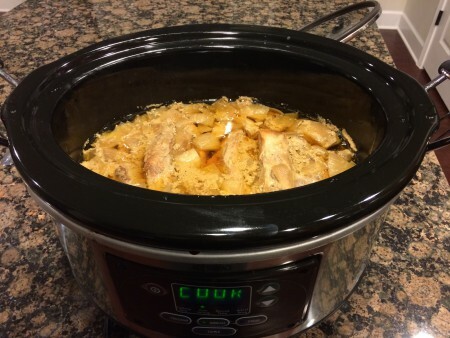 The slow cooker’s just finished cooking the honey mustard pork loin roast. It smelled delicious! 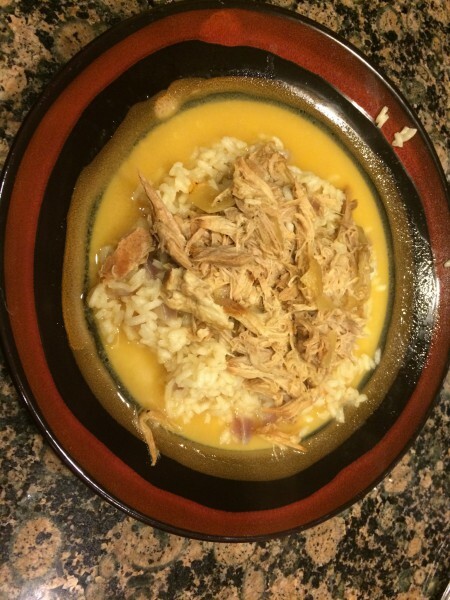 Here’s my slow cooker pork loin roast served with some arborio rice I whipped up. Doesn’t that look delicious?